If you’re after views alone, the South Rim won’t disappoint; its overlooks galore offer varied perspectives on the canyon. The higher, cooler North Rim―claiming only 10 percent of the visiting throngs―is more remote and bordered with wildflower meadows and thick stands of spruce. Plan ahead when hiking. If you’re going into the canyon, decide just how long you’d like to hike, then turn around once a third of that time has elapsed. Head out at dawn to avoid hiking in the heat of the day. Bring water. It gets hot here in the summer. Plan on 2 1/2 gallons of water per person for each day of your stay. 1. Bright Angel Trail. A good though long day option on this classic route into the canyon is the 9.2-mile roundtrip (with a 3,000-foot return climb) to the spring at Indian Garden. Very Strenuous Trailhead next to Kolb Studio in Grand Canyon Village. 2. South Kaibab Trail. A less crowded alternative to the Bright Angel Trail, its easiest day hike is the 1.8 –mile roundtrip to views at appropriately named Ooh-Aah Point 600 feet below the rim. It’s one of two main routes to the canyon floor, and there is a very strenuous trailhead south of Yaki Point on Yaki Point Road. Access by shuttle bus only. 4. Hermit Trail. This rocky unmaintained trail leads to views into Hermit Canyon and a good day option is the hike to the shade and wild grapevines at Santa Maria Spring. It’s a 4.5-mile roundtrip with 1,760-foot return elevation gain. Strenuous Trailhead 500 feet west of Hermits Rest at the end of Hermit Road/West Rim Drive. 5. Grandview Trail. A 6.4-mile roundtrip with 2,500-foot return elevation gain on this unmaintained trail leads takes you to outstanding views from wooded Horseshoe Mesa. Very strenuous Trailhead at Grandview Point, 12 miles east of village on Desert View Drive. 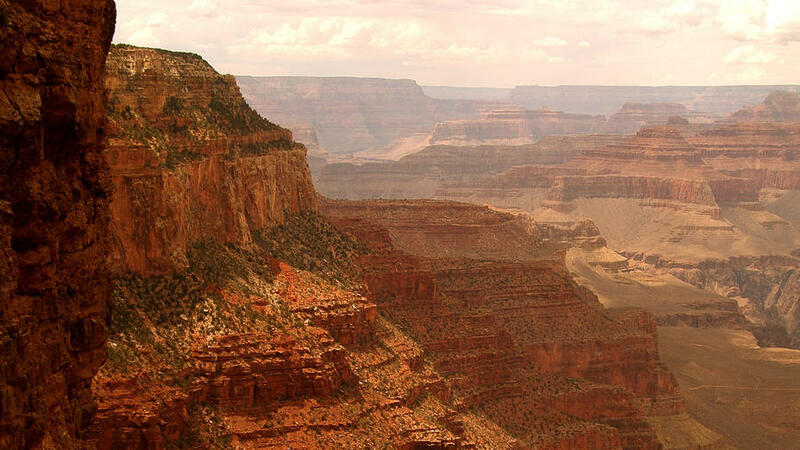 For maps and complete hiking information, visit the Grand Canyon National Park Service; . Seen it all before? The vast majority of visitors never get past Grand Canyon Village. So bus or drive to Hermit’s Rest, then walk a short distance and you’ll almost certainly find solitude. And though it’s a bit of a trek—about 215 miles from the South Rim—the forested North Rim is open from May 15 to December 1 and receives only 10 percent of park visitors. The Grand Canyon Field Institute offers terrific programs that include classes in photography, natural history, and guided multi-day backpacking trips into the canyon. For information, visit .